Diagnosis is usually based on darkening of the urine on standing. However, this condition may remain undiagnosed until middle age when multiple-joint pathology occurs due to destruction of the cartilage of the joints. Other possible clinical manifestations include renal stones and degeneration of the vascular media. In this case report, we discuss a case of alkaptonuria which was diagnosed clinically in the ENT OPD and the implications of such findings for the ENT specialist. A 56-year-old male patient was referred from the department of general surgery for evaluation of nodules visible on both pinnae. He had been admitted for treatment of cellulitis of the right lower limb. The patient had a history of multiple joint pains for the last 15 years for which he had been treated with non-steroidal anti-inflammatory drug (NSAID). There was no family history of similar complaints. No history of using disease modifying agents for joint pain. He was born of a consanguineous marriage. The patient had two siblings who are healthy and three male children without any symptoms. Routine blood and urine examination done at the time of admission for cellulitis were normal. On examination, the patient was found to have multiple nodules on both pinnae with maximum concentration of nodules on the ventral surface of the helix. The nodules were ranging in diameter from 2 to 3 mm and were bluish in appearance. The pinna cartilage was hard on palpation [Figure 1]a and b. The patient was advised excision biopsy of the nodules under local anesthesia. During the biopsy, to our surprise, we found a diffuse darkening of the sub cutaneous tissues and the cartilage of the auricle which were appearing black in color. On examination, the patient had a dark brown discoloration of the tympanic membranes [Figure 1]d and e. Diagnostic nasal endoscopy showed similar pigment deposition on the cartilaginous part of the nasal end of the Eustachian tube More Details [Figure 1]c. Videolaryngoscopy showed brownish discoloration of the valleculae and the pyriform fossae as well [Figure 2]a and b. Systemic examination showed brownish black macules on the hypothenar part of both hands and blackish discoloration of the tips of the fingers [Figure 1]f. The rest of the systemic examination was unremarkable. The histopathological examination showed skin beneath which was cartilage with degenerative changes and dermal perivascular mononuclear infiltrate with hyalinized collagen. The specimen was negative for amyloid on special staining. Urine ferric chloride test and silver nitrate tests were done and showed characteristic darkening of urine. Copper sulfate test  showed characteristic pinkish colouration of urine. Urine was also sent for homogentisic acid estimation and the sample was forwarded to Mumbai for the same. Orthopedic, cardiology and urology opinion were sought. X-ray of the knees and spine showed reduced joint space, cartilage degeneration and areas of calcification in the joints [Figure 2]c and d, echocardiogram and ECG revealed no significant pathology. Urine test for homogentisic acid was reported as negative. Urine silver nitrate test was repeated and showed characteristic blackening of urine. The patient was put on long term high dose of vitamin C (1g per day PO) and genetic counselling of the family members was done. The family members were advised phenotypic screening by means of urine silver nitrate test. Alkaptonuria is an autosomal recessive (3p21 - 3p23) inborn error of metabolism which is characterized by the deficiency of the enzyme homogentisic oxidase. Although alkaptonuria is a common disorder among the inborn errors of metabolism, the clinical presentation as ochronosis in the department of ENT is uncommon. Typical clinical features appear after the age of 30 years. , Here, we have a patient who had the typical manifestations of joint disease for which he was being treated without diagnosis of alkaptonuria for 15 years. Due to his dark complexion, the darkening of the cartilages and skin would not have been very obvious. On discussion with the pathologist, a diagnosis of ochronosis due to alkaptonuria was considered. Since the nonspecific tests for alkaptonuria were positive - especially the silver nitrate test which showed characteristic top down darkening of urine, we assumed that our diagnosis of alkaptonuria was confirmed. However, the urine test for homogentisic acid was negative. In view of confusing results, expert biochemist opinion was sought. A review of the literature revealed that there are no well-accepted standards for measurement of urine homogentisic acid. The clinical features supported the diagnosis of ochronosis. The possibility of exogenous ochronosis due to use of drugs like hydroquinones and antimalarials was considered. Since there was no history of ingestion of drugs like hydroquinones, this possibility was excluded. In the absence of standards for estimation of urine homogentisic acid, the possibility of deterioration of the urine sample during transport, typical darkening of urine on silver nitrate test and characteristic clinical features, we felt that our final diagnosis of ochronosis due to alkaptonuria was correct. Although treatment of this disorder is difficult and often futile, treatment approaches described include high dose of vitamin C, nitisinone, protein restricted diet, various vitamin supplements  and even gene therapy. No single treatment approach has been found to have much benefit in advanced stages of the disease. This case report highlights the role of the ENT specialist in the diagnosis of this rare disorder. 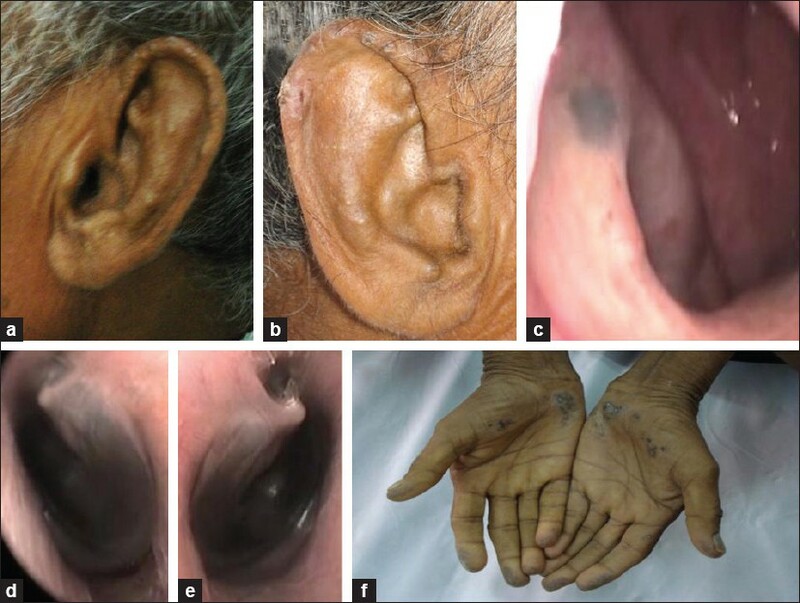 Although the clinical manifestations of ochronosis occur late in the course of an alkaptonuric patient's life, we must be alert for typical features like darkening of the pinna and tympanic membranes to aid in the diagnosis. Thanks to the Departments of Biochemistry and Pathology, M.S. Ramaiah Medical College, India. 1. Rodwell VW. Catabolism of the carbon skeletons of amino acids. In: Granner DK, Mayes PA, Murray RK, Rodwell VW, editors. Harper's Biochemistry. Singapore: Prentice-Hall, 1998. p. 318. 2. Grosneau L, Marinescu R, Laptouin D, Botezatu I, Staniceanu F, Zurac S, et al. A late and difficult diagnosis of ochronosis. J Med Life 2010;3:437-44. 3. Valmikinathan K, Verghese N. Simple colour reaction for alkaptonuria. J Clin Pathol 1966;19:200. 5. Introne WJ, Kayser MA, Gahl WA. Alkaptonuria. In: Bird TD, Dolan CR, Pagon RA, Stephens K, editors. Gene Reviews (NCBI Bookshelf). Seattle, Internet; 1993. 6. Levin CY, Maibach H. Exogenous Ochronosis. Am J Clin Dermatol (ADIS International) 2001;2:213-7. 7. La Du BN Jr. Are we ready to try to cure alkaptonuria? Am J Hum Genet 1998;62:765-7.